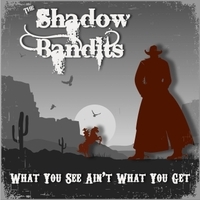 The Shadow Bandits are producers and multi-instrumentalists Joey Stuckey and Charlie Hoskyns. The song “What You See Ain’t What You Get” features renowned Georgia vocalist Sue Lu and was written by Joey Stuckey, Charlie Hoskyns, Paul McGuinness, and Will Morrison. SUE LU is the alter ego of Sue g. Wilkinson of the ambient singer/songwriter duo Cypress South. Lu’s adventurous spirit blended with a diverse, eclectic musical background has given birth to a Rhythm and Blue's band that has toured extensively throughout the US as well as Europe and Japan. Davy MacFarlance, writer for Blues Matters, (UK's most read blues magazine), says Ana Popovic“…could be fighting for a space in a crowded field given the amount of blues’ women around like Bonnie Raitt, Susan Tedesch and the most “Excellent Sue g. Wilkinson." SUE has performed in England as well as Scotland, including high profile gigs at Burnley International Blues Festival, The Lemon Tree in Aberdeen Scotland, The 12 bar club in London, The Musician in Leicester and The Studio in Hartlepool,. In addition to these great gigs, some of her favorite performances were in Japan where she performed twice through two different cherry blossoms festivals and spent a great deal of time entertaining her Asian fans. Denmark is the home of her former label Ap Records, and Lu and toured there twice. Chili Peppers, Ministry, Lush, The Indigo Girls, Hem, Grateful Dead's Bob Weir, Michelle Shock, Kansas, Acoustic Alchemy and most recently Art Garfunkel and Jane Siberry among many others. Will has played drums/percussion with Sugartrain, Don Mescall, Lisa Knapp and played a couple of BBC sessions with her, Sid Griffin and The Cole Porters..he also played with WHO legend JOHN ENTWISTLE ….He toured the US with Modern English whilst enjoying popularity with their hit single I MELT WITH YOU....He joined The Popes whilst arranging, drumming and co producing their last two albums. Inductee. He has worked with Alan Parsons, Jimmy Hall, Mike Mills (REM), and many more.